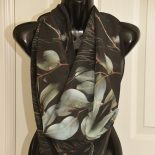 Scarves featuring Bendigo Flora on show, downstairs floor, Finders Keepers, Bendigo. Greenaway uses her photographs of local flora to design scarvesthat are unique to Bendigo. The fabric chosen ranges from cotton, cotton jersey,cotton/silk and silk crepe de chine. Not only does Greenaway design the fabric she also sews theprinted pieces into several scarf styles. Greenaway also has her work permanently available at localtourist outlets including the Visitor information centre and the GoldminesMuseum. This entry was posted on January 11, 2019 by sharongreenaway in #sharongreenaway.